What do you think about when you see the colour green? When looking at the colour blue, what do you feel? These are some of the questions that Aiden opened up to our group when we had the pleasure of learning alongside him during a paint workshop this past week. 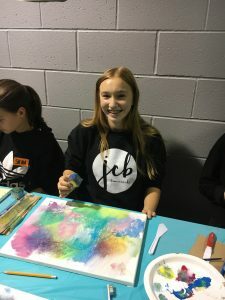 Aiden Lee is an incredibly talented artist, specifically in the area of abstract painting, and enjoys sharing his gift through teaching others. As a past Dance Ability dancer himself, Aiden understands and advocates how creative arts are an important and valuable form of communication and expression. Aiden has a diagnosis of Autism, and though he is very verbal (and hilarious) now, he was a non-verbal child up until the age of 3 ½ years old. He turned to art as a form of communication, and through the use of colour, texture, different styles and mediums, he continues to use his art as a form of telling the world how he feels. Aiden lead a group of Dance Ability Occupational Therapists, Volunteers, and Dance Teachers through an interactive and captivating art workshop. 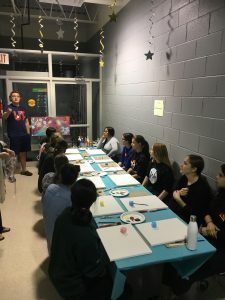 In this workshop, Aiden explained the beauty in abstract, unpredictable, and uncontrolled artwork. He encouraged us to think outside of the box and not turn to your typical picture of “a house with a window, door, and some trees” when he told us to put our pencils to canvas. All the attendees were instructed to allow our pencils to flow naturally, quickly, and without thinking twice. This caught some of our group members off guard, but was an incredibly valuable lesson to learn. He encouraged us to just do what felt right, without thinking too hard about it! Aiden also encouraged us to use our form of art as a completely independent and individualized form or expression. 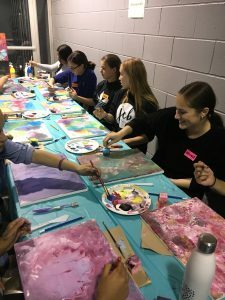 Though our paintings started to look similarly to the peers around us, the final products were incredibly unique and beautiful masterpieces. 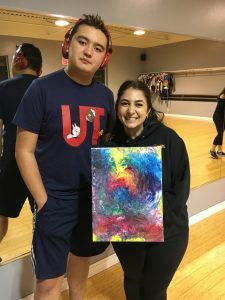 As a dance teacher with the Dance Ability Movement, I found it so valuable to have Aiden share his perspective of living with Autism with our group. Aiden taught us more than just how to create a beautiful abstract painting. The bigger lesson was that individual’s on the Autism spectrum may not express themselves in a way we’re used to, but that doesn’t mean they lack emotion, creativity, or the ability to communicate. What a valuable experience it was to learn, create, and laugh alongside Aiden! Aiden is now 14 years old and has taught over 1,300 students across on Ontario. Aiden has a gift not only in art, but in advocacy and expression and we were so lucky to have experienced this from him. Aiden shares his passion with others and advocates to the world what it’s like living on his side of the spectrum, and we look forward to cheering him on as he continues to make his mark on the world around us! We would like to thank both Aiden and our very own Miss Chiara from JCB Danceworks for her reflection of Aiden’s workshop. Thank you Aiden and Chiara!